Erect subshrub or woody based perennial to 1.5 m. Stems tomentose. Leaves: lamina 4-10 × 3-7 cm, ovate, stellate-tomentose, glabrescent; base cuneate; margin entire. Flowers 4-16 in a cluster. Corolla greenish, tomentose externally. Fruit a berry, 8-10 mm in diameter, spherical, glossy, scarlet, enclosed within an enlarged accrescent calyx, c. 2 cm in fruit. Habitat: Roadsides, disturbed ground, termite mounds, open woodland and riverine vegetation. Worldwide distribution: Native to the Old World subtropics; now widely distributed from Europe south through Africa to South Africa and from the Middle East to India and southern China. Gonçalves, A.E. (2005). Solanaceae Flora Zambesiaca 8(4) Pages 56 - 58. (Includes a picture). Heath, A. & Heath, R. (2009). Field Guide to the Plants of Northern Botswana including the Okavango Delta Kew Publishing Page 110. (Includes a picture). Kirby, G. (2013). Wild Flowers of Southeast Botswana Struik Nature, Cape Town South Africa Page 117. (Includes a picture). Pooley, E. (1998). A Field Guide to the Wild Flowers of KwaZulu-Natal and the Eastern Region. Natal Flora Publications Trust. Durban. Pages 72 - 73. (Includes a picture). Wild, H. (undated, c. 1955). Common Rhodesian Weeds ?Government of Rhodesia, Salisbury Page 91. (Includes a picture). Hyde, M.A., Wursten, B.T., Ballings, P. & Coates Palgrave, M. (2019). 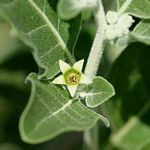 Flora of Malawi: Species information: Withania somnifera.